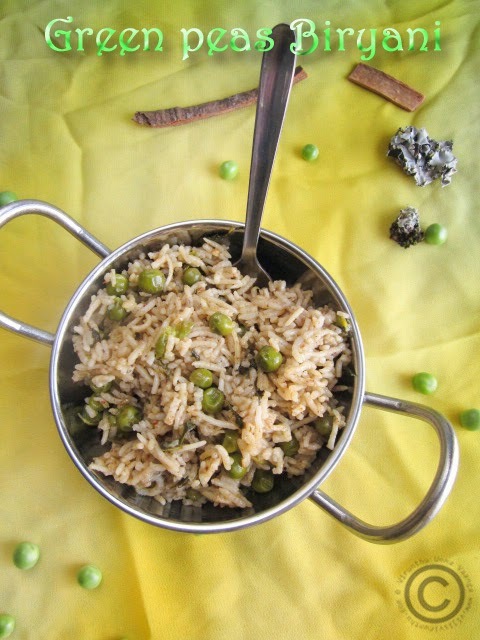 Hi friends, today’s post for Vegan Thursday-VT, simple one pot biryani with fresh green peas. 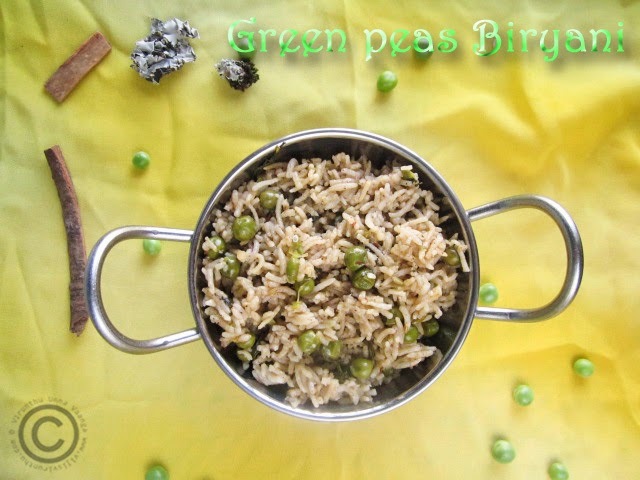 I already shared green peas pulao at very beginning of my blog. 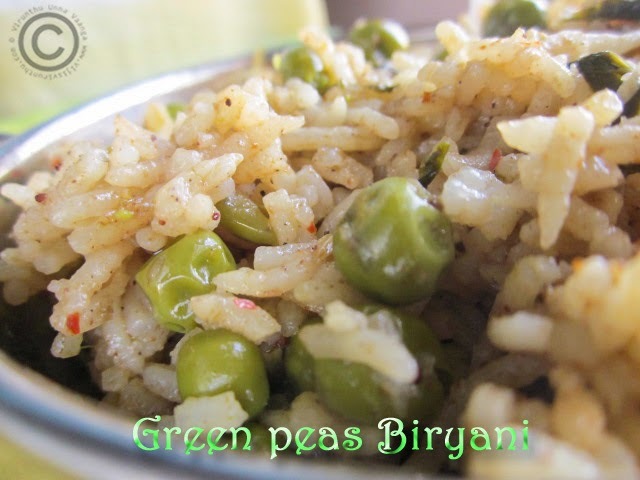 Fresh green peas are now available, so you can make varieties of recipes with the healthy peas. 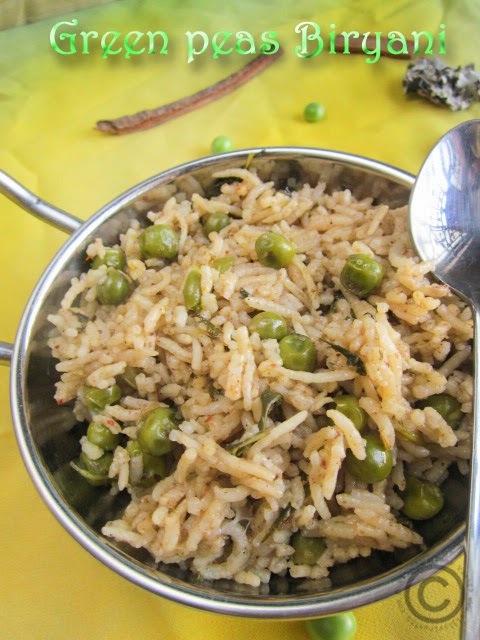 Grind the green and red chillies with shallots and fennel seeds. Wash and soak the rice for 20 minutes. Heat pressure cooker, add oil and then add bay leaves and kalpaasi. Then add shallots sauté it till translucent, then add ginger garlic paste and sauté it till the raw smell goes off. 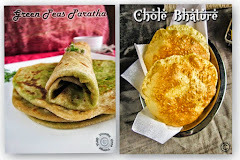 Add coriander leaves, mint leaves and sauté it well, following by add CCC powder and mix it well. 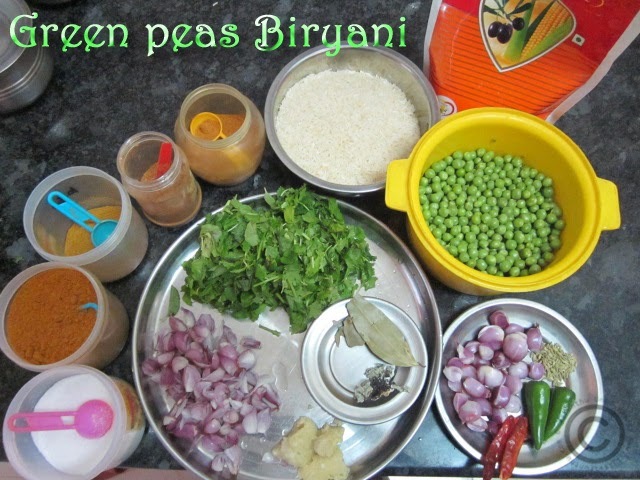 Now add green peas, sauté it well and then add red chilli powder, coriander powder and salt allow cooking till the oil oozes out from the mixture on low flame. Pour 4 cups of water (I added rice soaked water), and allow boiling on high flame and add drained rice and allow cooking till boiling. 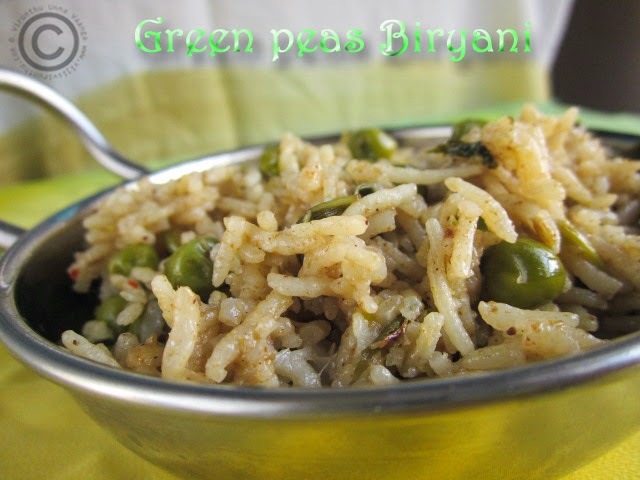 Cover the pressure cooker lid and after the pressure release, put vent, switch off the flame after 2 whistles. Stand it for 15 minutes and then open and stir it gently. 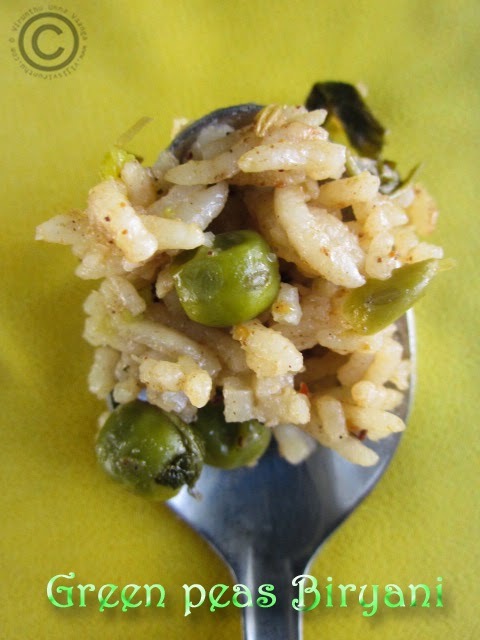 You can replace dry soaked peas or any other beans. CCC powder is main ingredient for the aroma and color of the biryani. You can add coconut milk instead of water. 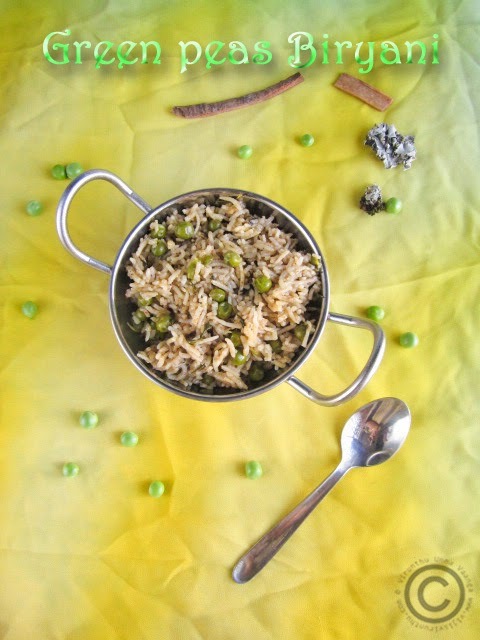 wow..lovely masala and peas Biryani sounds so good and flavorful! tempting clicks viji! Perfectly done ! 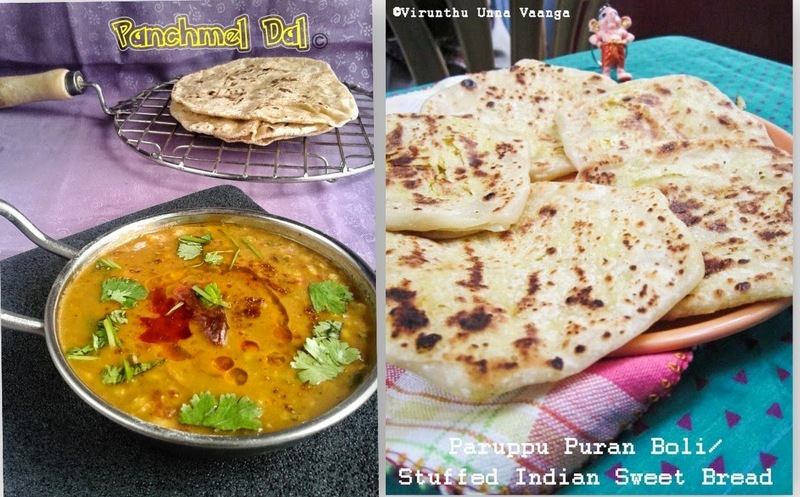 Both dish and click ! 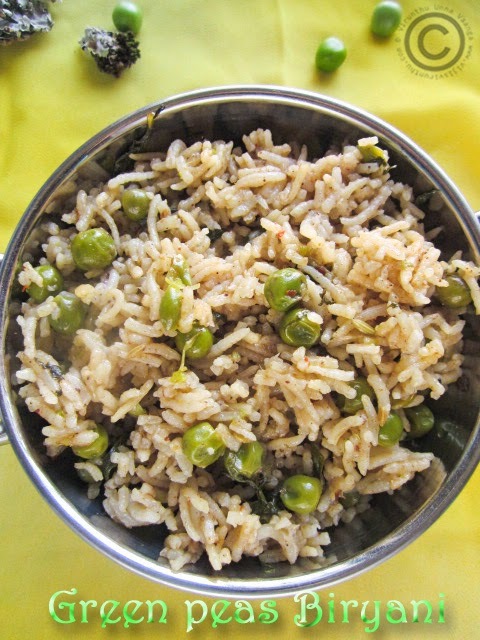 super biryani...your step by step pics are epic sis! !